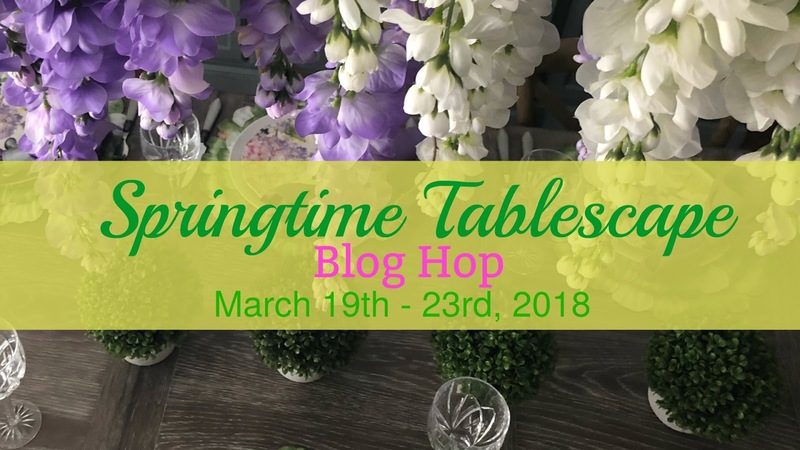 Greeting friends, time for another tablescape Blog Hop. Since Spring is almost here, this party is all about spring. 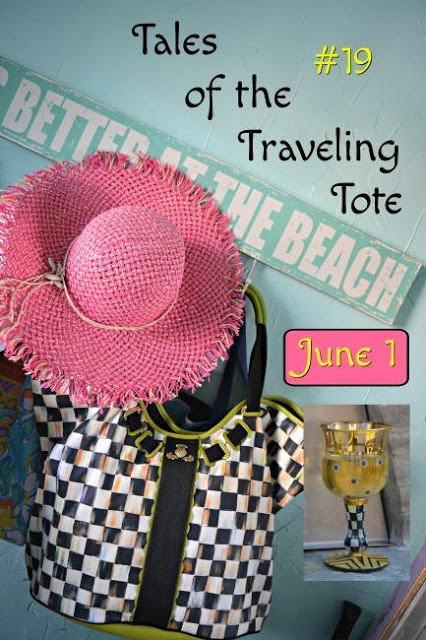 Chloe from Celebrate and Decorate has once again organized this fun blog hop. You will find the links to this party at the end of this post. Have fun and get inspired! Instead of my Breakfast room, I have decided to decorate our dining room. This table can accommodate up to 14 people. Having fun with our Mackenzie Childs Courtly Check dishware and accessories. Hurricane is decorated with yellow easter grass and an harlequin candle...battery of course. The harlequin table runner keeps with the theme. This candy favor is a bottoms up bunny. You can't help but love these cuties. The Mackenzie Childs rabbit gets all of the attention being centered in the wooden box my husband built. It is flanked by two darling chicks with carts. Tulips make me happy and they definitely portray Spring. Mr. and Mrs. miniature bunnies. I guess you can say, I love bunnies. The burlap bags are decorated to match the table's theme. I glued the harlequin ribbon to the top of the bag and added some cute chicks and rabbits. I thought I would change up the flatware by adding them to the burlap bag. Naturally the bag holds MC's flatware. 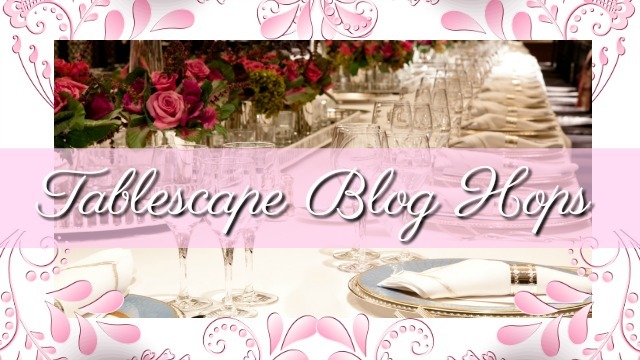 By all means, have fun visiting the other talented ladies sharing this spring tablescapes. Brilliant! 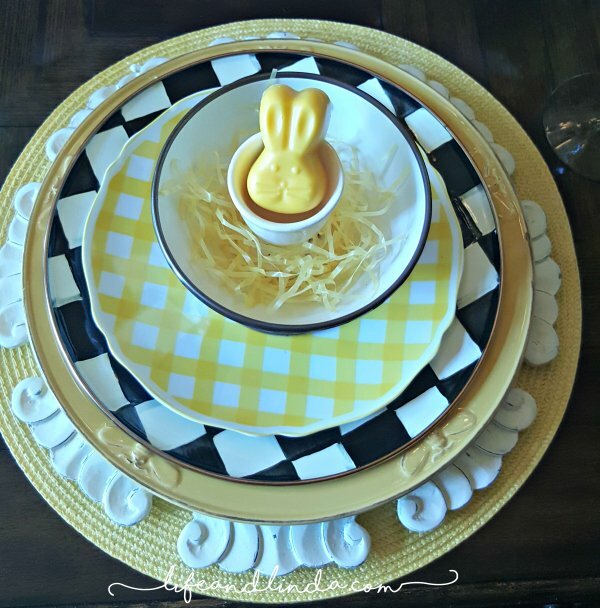 Love your Mackenzie and Child easter tablescape, is fun and original. Bravo! Thank you Donna, I try to come up with different creative ideas. Mary, thanks so much. I always swoon when I visit your tablescapes. Decorating for spring is always fun. So bright and cheerful, very cute rabbits! Fabulous table, Linda!!! 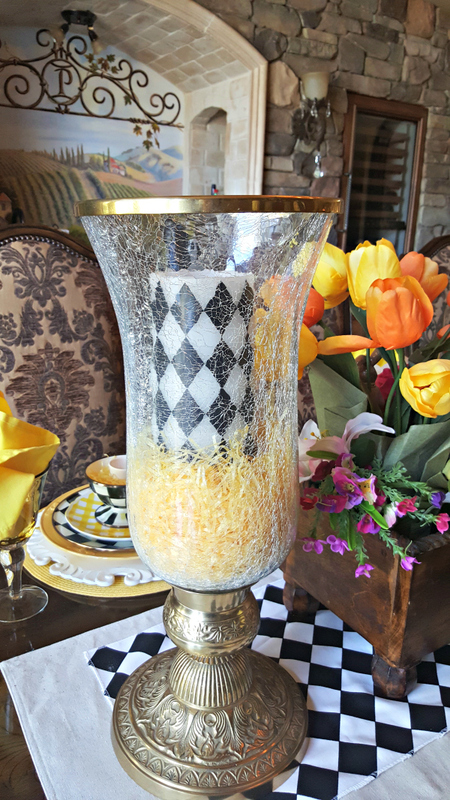 I love the Courtly Checks paired with the yellow, your dish stack is gorgeous! 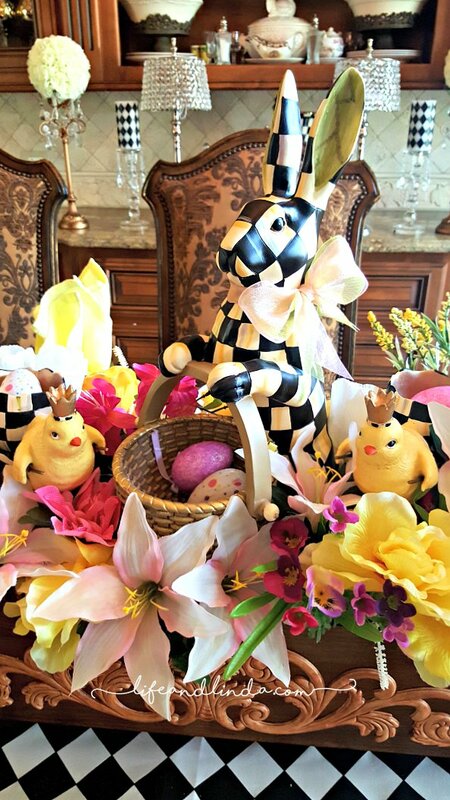 The cute little bunnies tucked into the centerpiece are a pleasant surprise. 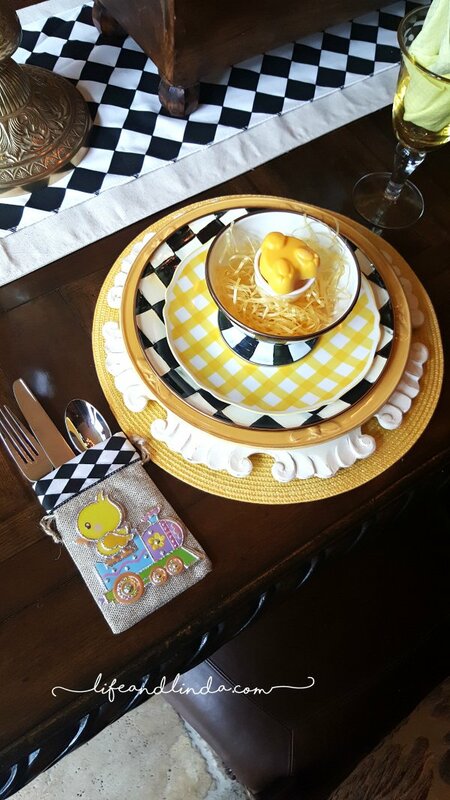 Your special added touches of the bunnies in the egg cups and the flatware bags are sweet. Love it all!! Hello Ann, I am so glad you noticed the extra little details I added. Looking forward to seeing your Spring table. I hope MC sees all this Linda..I love all the CC mixed with bunnies and chicks..so cute! Thank you Monique. I hope they see it as well. It has their products all over this post. How adorable Linda!! Courtly Check is so versatile and wow it looks great with yellow! I love how you tucked those sweet bunnies into the flowers and your clever flatware bags. Thee MKC bunny is fabulous! You will have all of the TT's drooling today! Jenna, I agree with you, Courtly Check goes with everything. The MKC bunny was bought last yeaR on sale. I am so looking forward to seeing your sweet table. Wow, love it. There is nothing like seeing a huge table that can fit your whole family to really feel inviting for a nice family get together! The MKC theme is always such a stunner too. Such a timeless collection. SO beautiful Linda! Thanks Christine. We love having this large dining room and table. I am having so much fun with the MKC collection. Very pretty Linda! Love the combination of the Courtly Check with the yellow. I really pops! Also love the centrepiece. It is lush and really speaks of spring. Love your little bunny party favors too!! Maureen, playing with dishes is fun! I am loving the Courtly Check with the yellow. Hi Emily, thank you. Paul did a great job on the wooden box. He followed my instructions to a t....LOL You are too sweet. I hope Mackenzie Childs notices this table. By all means, drag those chicks and rabbits out. Delightful and happy table. Love your bunnies and chicks. Your husband outdid himself with your new box. Love the feet on it.How cheerful to pair the yellow with all the MCK accessories. Also ,love how you did your plate stack. I'm wanting some of the white wooden chargers because they add a neat dimension. 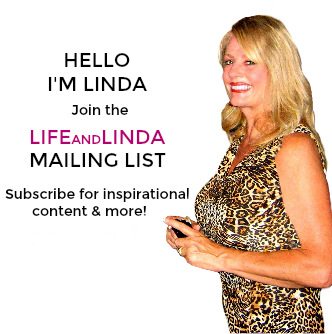 Linda, I love the fun and whimsy at your table! The box that your hubby made is so special! 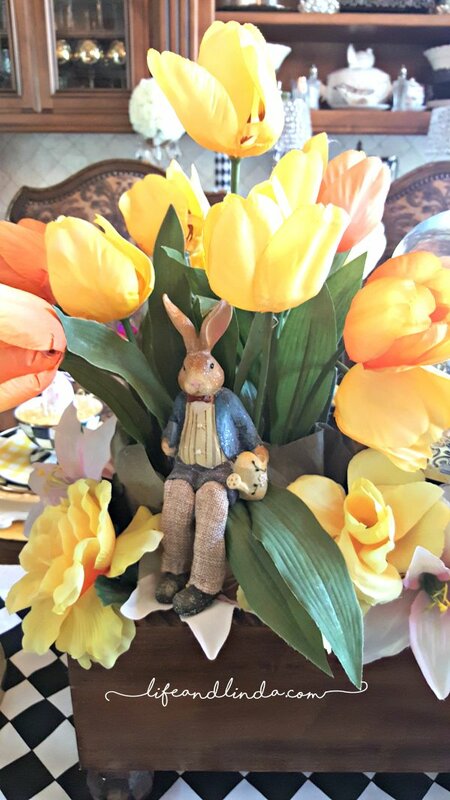 Tulips, bunnies, and MC Courtly Check are perfect for spring and the addition of the yellow check plates adds just the right touch! I always enjoy blog hopping with you! Pam, thank you. It is such a pleasure to blog hop with you too. I am loving all of the spring time inspiration. I chose yellow for it's cheery color. 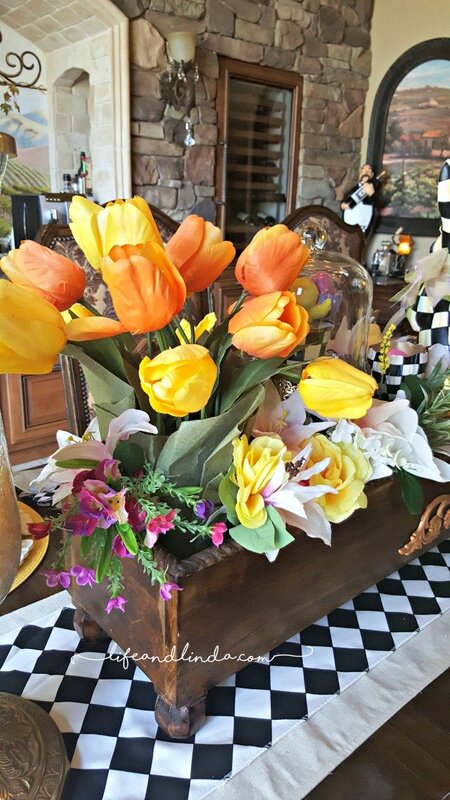 Linda, what a beautiful, happy, and cheerful spring table! I love how you made the burlap flatware holders, and your floral arrangements are stunning! Your home is gorgeous and that chandelier above the dining table is so pretty! Happy Spring!!! Shannon, you too have a gorgeous home. Cheerful and happy always make me smile. Thank you very much. Linda, you have done it again and your table is inspiring. The MC touches are perfect paired with your bright yellow! So whimsical and classy at the same time. It is always a pleasure to blog hop with you because of your attention to detail. Love it. Thanks Kari, I try to create different themed tables. I am looking forward to seeing your spring table. 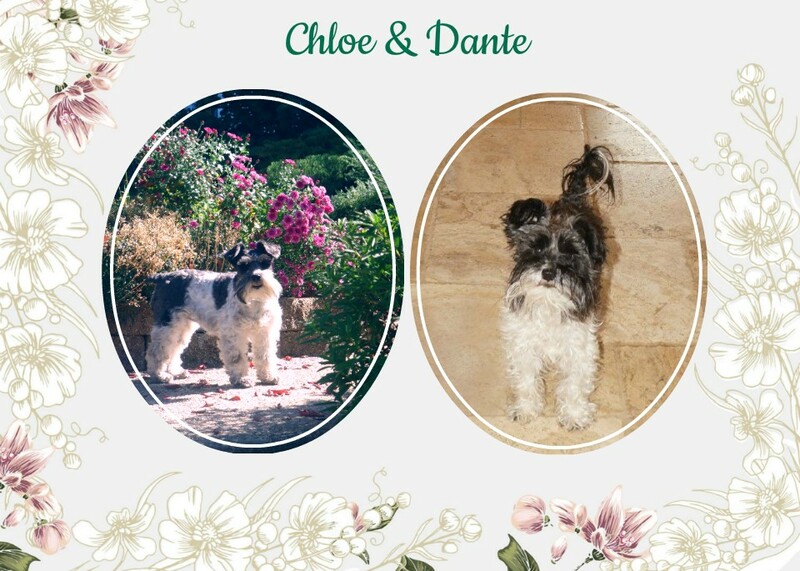 Enjoy the blog hop. Oh my goodness friend, this is one delightful, charming, bright, beautiful and happy table! I love everything! This rabbit is gorgeous! 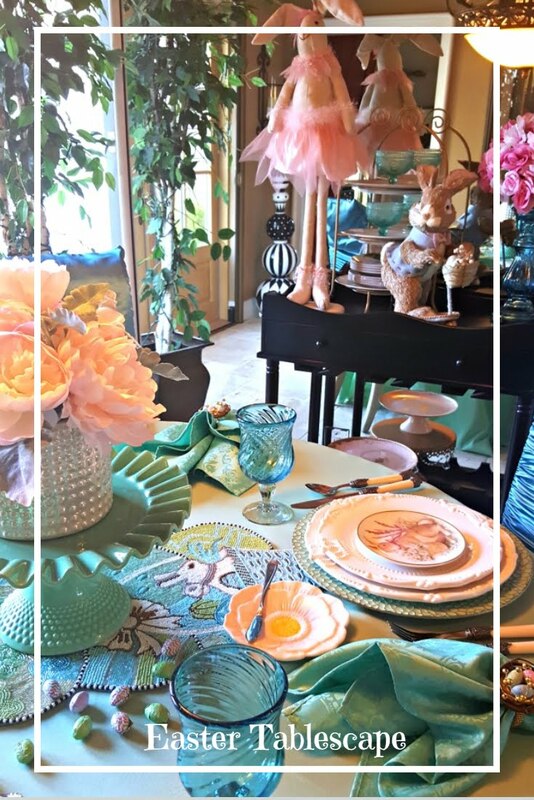 Love the bunny party favors and all of the Easter joy this table brings! 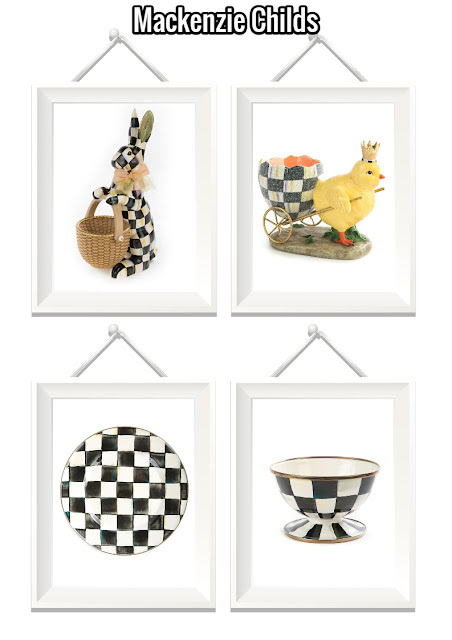 Linda, the black and white checks are such a cute contrast to the yellow Easter decorations. Love all your bunnies. Glad to be back on the Spring Tablescape blog hop with you. Thank you Carol. Amazing how black and white goes with everything. A pleasure blog hopping with you. Very nice, really liked the utensil pouch. Thanks so much for your visit. Here's to an early spring. Hi Joan, thank you. I so admire your skills on decorating cookies. You are so gifted! Linda, your Easter table is full of spring goodness. I love bunnies too, and they are certainly hopping about around here. I have lots of bunnies, but my Courtly Check bunnies are some of my favorites. Just can't resist! How wonderful that your hubby made that fantastic box. It makes a perfect centerpiece! Sarah, your MK collections amaze me. You truly have a gift for arranging. Love your bunnies and collectibles. Those Courtly check bunnies are so addicting. Here's to a happy spring. 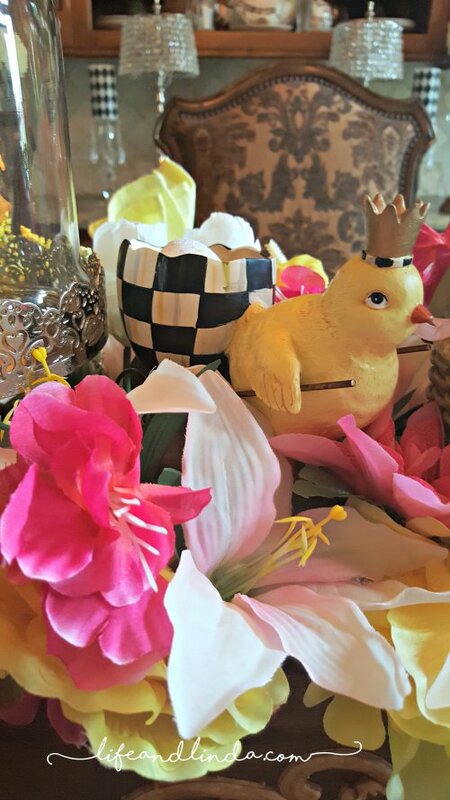 What a happy and colorful Easter table you’ve created! Love the MC accents. The yellow and white checked plates are so cute layered on top of the MC Courtly Check dishes. The napkin holders are the cutest especially with the gingham accent. Like me you have lots of bunnies! Your center arrangement is so cute- that box Paul made is perfect. The courtly checked bunny with the basket is adorable. 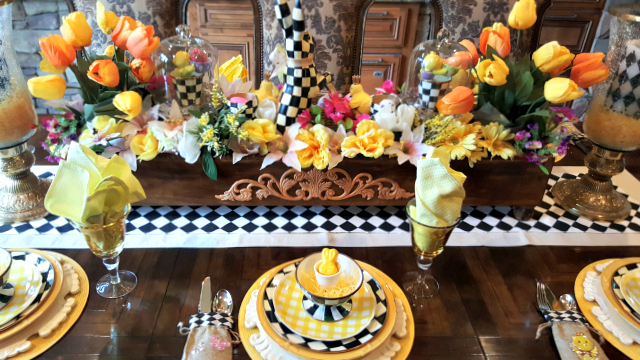 I love seeing your Mackenzie Childs dishware, and that rabbit steals the show! I was thrilled to be able to visit the Mackenzie Childs store when I was in New York City a few weeks ago. There were so many great things to see in there. Linda... I have looked at a lot of table settings lately. I have to say that yours is one of the most beautiful. Have a wonderful week. You are so kind! Table settings vary and I love the different inspirations. Thanks for making my day. Love this dinnerware!! The Harlequin bunny is one of the best Easter decorations I've seen in a really long time - I think one of those will be coming home with me! 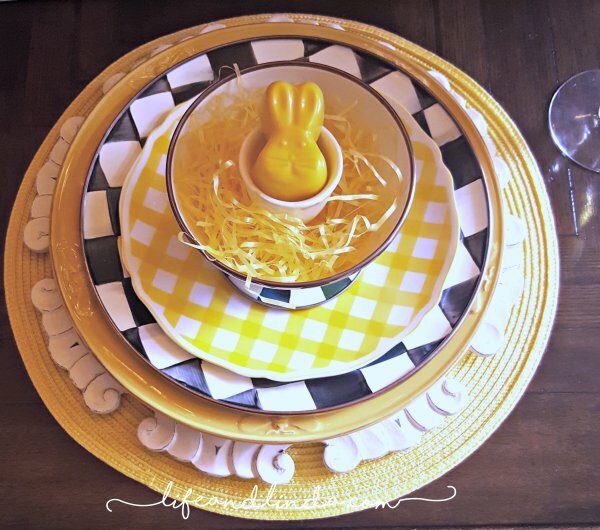 Beautiful job on your table – happy Easter! 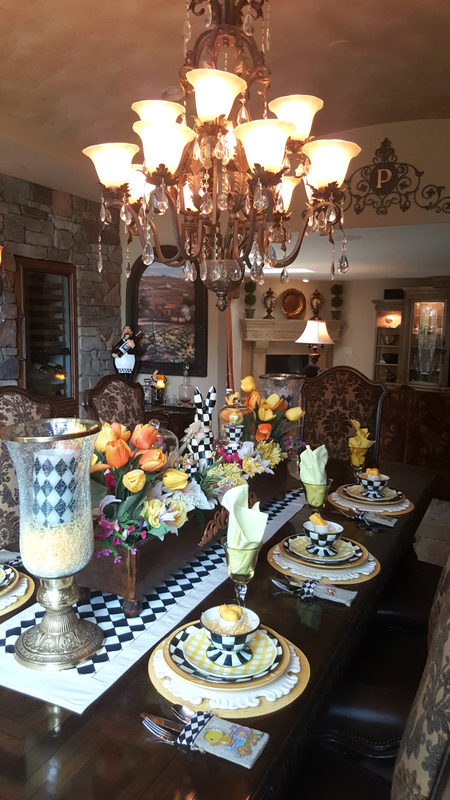 What a festive table - Love the yellow plaid luncheon plates! I am sure your guests will enjoy sitting at this pretty table!! I love how well the black and white goes with the yellow check. This table looks fun. Thanks so much Lisa. It is a fun and whimsical table. I am loving the yellow with the black and white. Thank you, so glad you enjoyed this table. Linda, that's gorgeous! I love MC with yellow, it looks so sharp! Yellow must be one of my happy colors, I am always drawn to it (that and green, too). Love the box your husband made for you, and those MC chicks & bunny look right at home. Your bags trimmed in the ribbon are a great way to add MC style without breaking the bank, and those bottoms bunnies - too cute! I need to find those. Rita, happy colors are wonderful. They liven up the room and are so cheerful. I can see why you love yellow and green. I will give my hubby the kudos again about the wooden box. Just gorgeous! Love the yellow plaid mixed in. Everything is so pretty. Thank you Kris, this table makes me smile. Oh that black and white rabbit, bee still my heart! Thanks Debbie. I bought that cute bunny last year on sale, along with the chicks. Linda, your table is fabulous! 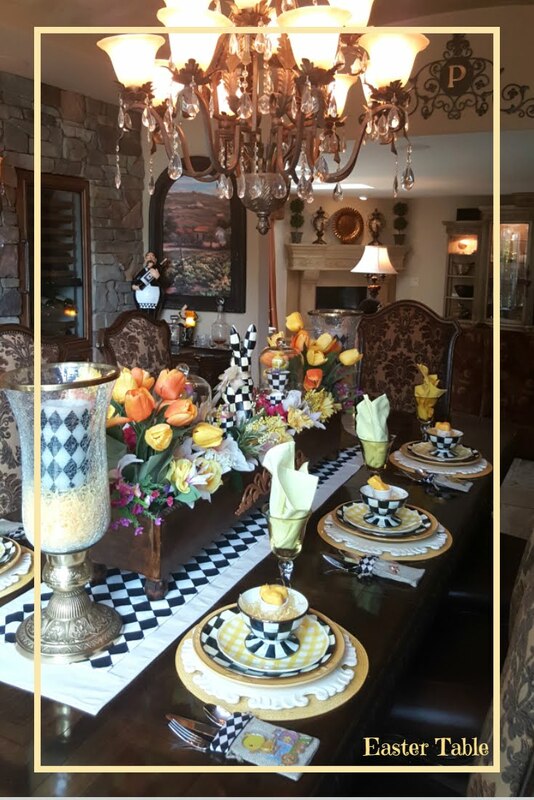 I love all the MacKenzie Childs items and that box your husband built is outstanding! The bags you made for the flatware are so cute. I thought they were MC. Your guest will enjoy this beautiful table on Easter! Catherine, thank you. I am loving my MKC pieces. My hubby did a great job on the wooden box. I use it for different holidays. your Easter table is wonderful! Do you have all this lovely stuff at home? 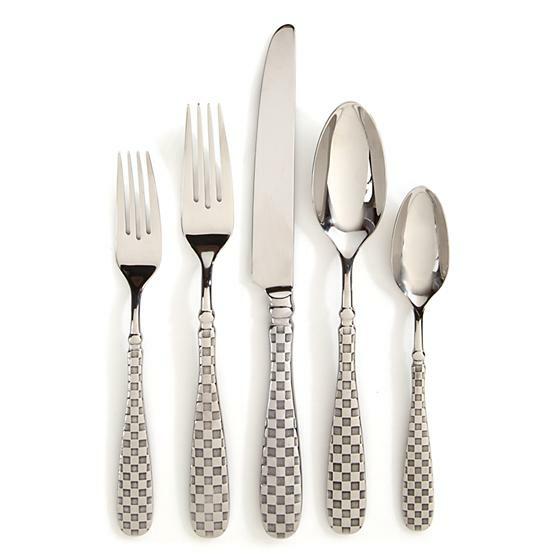 You always show us such wonderful tablesettings! 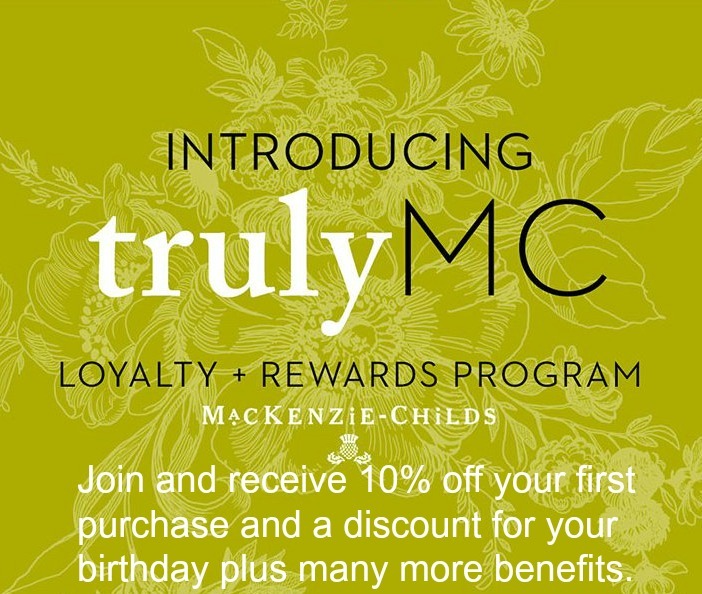 I love this Mackenzie Child Stuff! Thank you Debbie. I wanted to create a flow with the theme, so crafting did the trick! You are so sweet. Thank you Maria Elena. 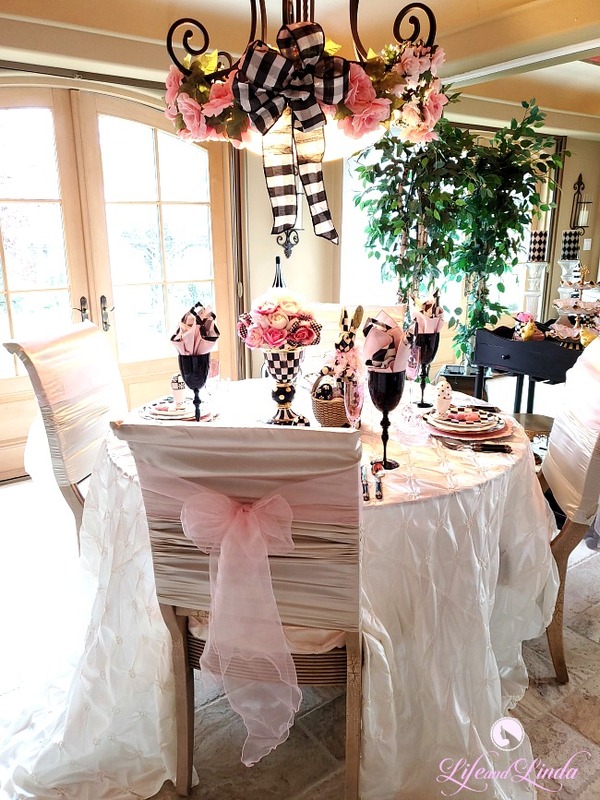 Your table is elegant, yet so fun and whimsical, too, Linda! I love the CC plates oared with the yellow and white gingham ones. 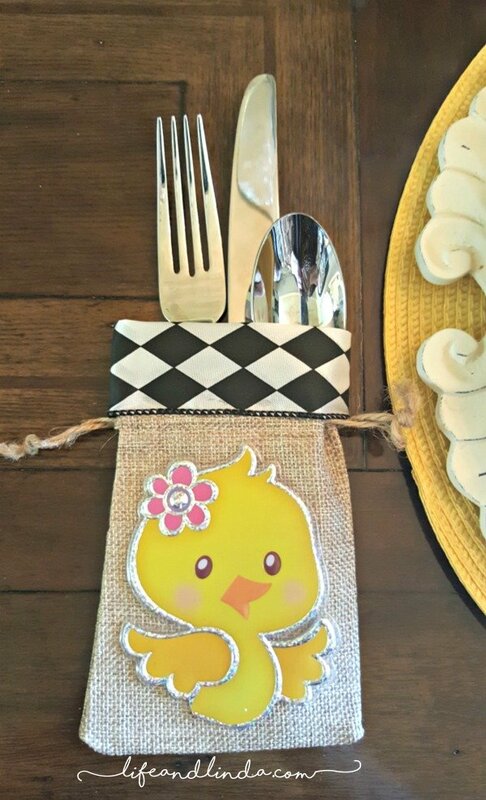 The burlap bags are so cute with the flatware. You have added so much to your collection of MC. Kitty, thank you. I am loving the yellow with the MKC dishware. It's amazing how the Courtly check seems to go with everything. Linda, your table setting is fabulous! I love MC, and I especially love that MC bunny! So enjoyed this post! Thank you Wendy. That bunny hopped right into my shopping cart...LOL alo0ng with the chicks. Your husband is a great master. I like the wooden centerpiece he has created. Thanks so much. I love the wooden box. I will give him some kudos. So fun and creative! Love love the mix of yellow with the black and white pattern. An unexpected mix for spring, but it works so well with the florals and other decor you added. Thank you Kari, I am thrilled with adding the yellow with black and white. iI is so unexpected for spring, but somehow works. Your table looks so pretty -- I love it!! Your place settings are so pretty with the combination of courtly check plates and the yellow bee plates and yellow and white gingham. 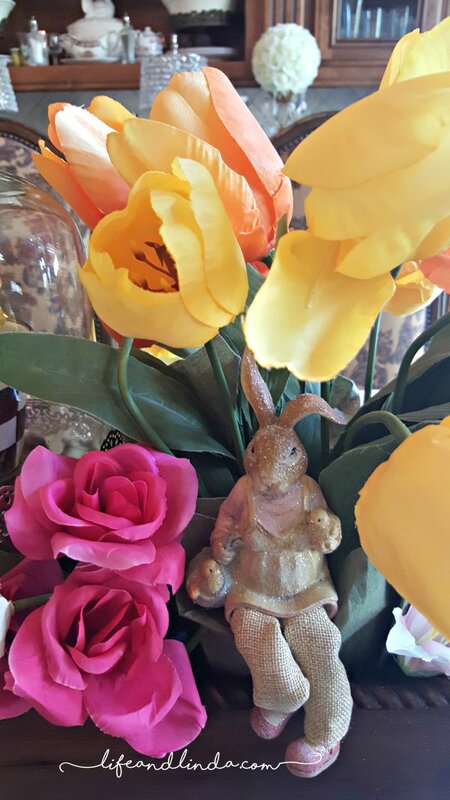 I love the courtly check rabbit as your centerpiece; he's so handsome. ;) Your husband made a beautiful box for your table; it really turned out great, Linda! 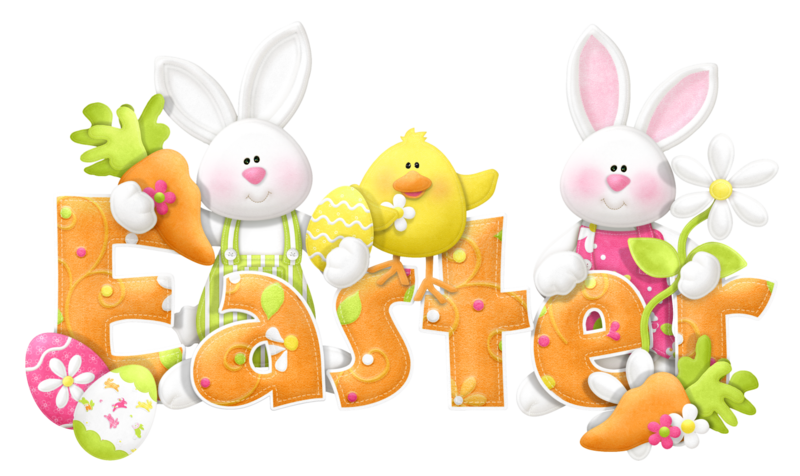 I hope you have a lovely Easter, and thanks for your visit yesterday. OMGoodness, this table is amazing! Love every detail! 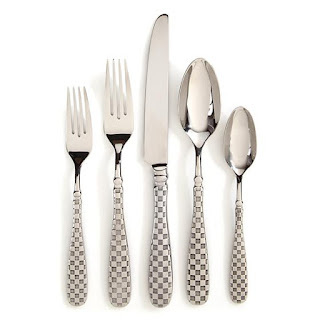 The bags holding the flatware are one of my favorite things about the table:) Of course the dishes are beautiful. That box is fabulous! Hope you are having a great weekend. 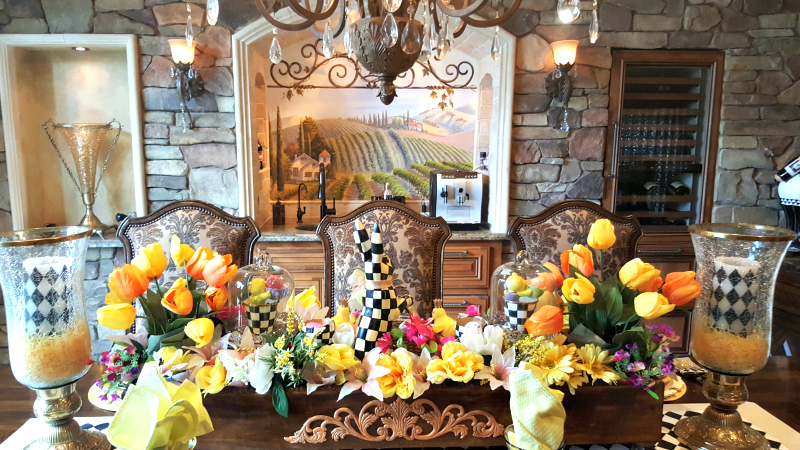 Linda, I love your Spring Tablescape! The Mackenzie Child’s theme is just stunning! Beautiful job! I’m obsessed with the little bunny! Linda, I stopped by Michaels to pick up some ribbon for Easter gifts and saw the darling gingham plates. They were 50% off, so I bought some in all the colors. The yellow with the Courtly Check is my favorite, but decided to get the pink and blue just to have. They are so cute!